…is a multicore adapter cable with eight different connectors, none of them matching. The cable is wired in such a way that if used with powered-up machines like recorders, mixing desks or microphones, it could potentially damage equipment. The different connectors refer to different generations of technology in my studio. Pieces of equipment from different eras or of different qualities often create adapter problems – not only between connectors, but also regarding their technical specifications, such as impendance, for example. For many years in the past I have encountered such difficulties challenging my technical skills. Many times I had to work around problems in the resulting sounds during post-production – in other cases I simply failed. All the different connectors used on this object refer to historical tape machines, contact or air microphones, digital or video signals, consumer level recorders and sound generating machinery of all kinds, roughly during the time when the tracks included in Compilation Works 1996–2005 were produced. 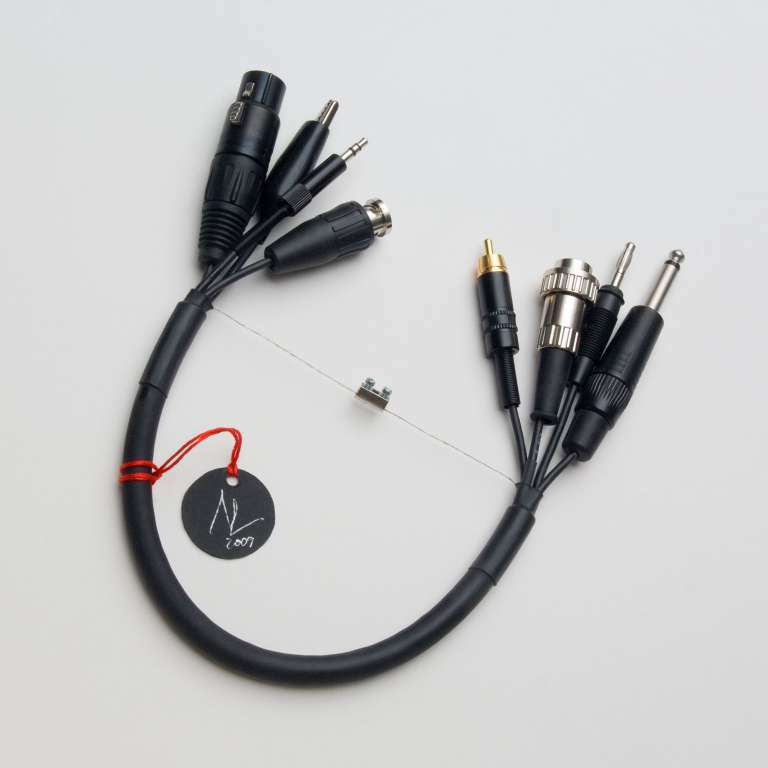 Original object: multicore audio cable with eight different connectors, steel wire, steel clamp, and cardboard badge. Overall length 46.5 cm. Edition: color photograph, Lambda print, 31.5 x 31.5 cm, edition of 19 copies.